Back cover blurb: Newlyweds Alice and Jake are a picture-perfect couple. Alice, once a singer in a well-known rock band, is now a successful lawyer. Jake is a partner in an up-and-coming psychology practice. Their life together holds endless possibilities. After receiving an enticing wedding gift from one of Alice’s prominent clients, they decide to join an exclusive and mysterious group known only as The Pact. The goal of The Pact seems simple: to keep marriages happy and intact. And most of its rules make sense. Always answer the phone when your spouse calls. Exchange thoughtful gifts monthly. Plan a trip together once per quarter... Never mention The Pact to anyone. Alice and Jake are initially seduced by the glamorous parties, the sense of community, their widening social circle of like-minded couples. And then one of them breaks the rules. The young lovers are about to discover that for adherents to The Pact, membership, like marriage, is for life. And The Pact will go to any lengths to enforce that rule. For Jake and Alice, the marriage of their dreams is about to become their worst nightmare. Jake and Alice are newlyweds, a picture perfect successful couple. Alice once a singer in a rock band is now a successful lawyer, whilst Jake is a partner is a successful psychology practice. When they receive an intriguing and exotic gift as a wedding present from one of Alice's most high profile clients. In short it is an invitation to join an exclusive group known only as the Pact. The goal of The Pact seems simple: to keep marriages happy and intact. Sure, the Pact has rules, but most of these rules make perfect sense to ensuring a happy Marriage; Always answer the phone when your spouse calls, exchange thoughtful gifts monthly, plan a trip together once per quarter. . . .
Enticed into the group by its mystery and promise of glamorous gatherings (Alice loves a party!) Jake and Alice are keen to make new friends and embrace their new lives as members of the Pact and very happy newly weds. Sadly only one of these things can last... Jake and Alice are about to find out that the Pact isn't all it appears to be. Particularly if you break a rule! The Marriage Pact is a novel that may seem a little far fetched, but although I've not yet researched this online, I wouldn't be surprised if some sort of "cult" like this did in fact exist. 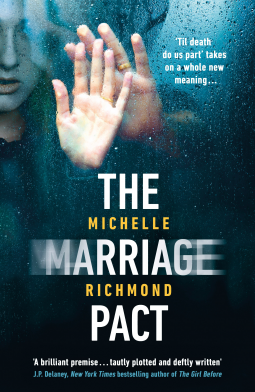 The Marriage Pact is available now via Amazon online and all good book shops.